I always love the non-dominant hand challenges. I don't often do it until I get a reminder, so thank you, Diva, for the challenge this week. I decided on Sunday nite to save my next calendar entry for the challenge. When I saw what it was, I immediately wanted to change my mind. 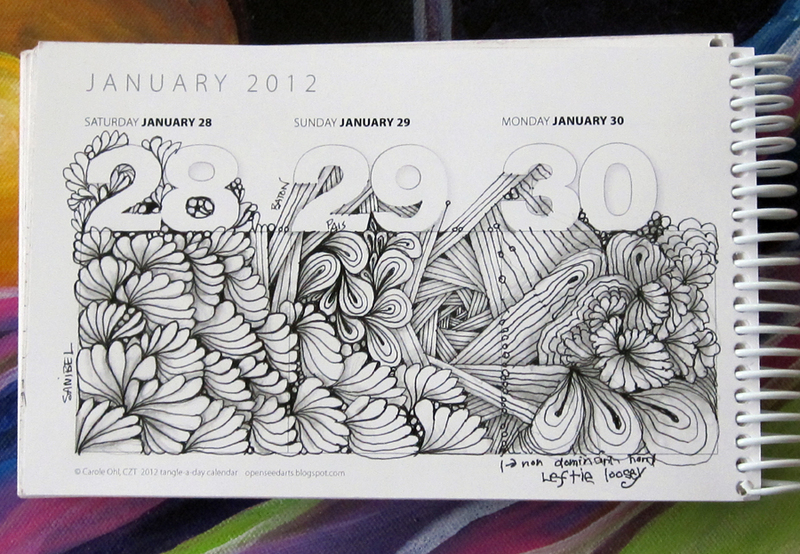 I really liked the way the two previous days on the calendar page looked, and I was afraid I would 'mess it up'. As soon as that thought hit my brain, I knew that I HAD to do the challenge with my left hand in the last empty box on the page. I then figured I might as well repeat what had already emerged in the two previous days, to see what it would feel like to do the same thing using my left hand. It was a struggle about a third of the way through, as I had to gently tell my critical voice to take a breather while me and the joy voice had a little fun. Once I let go of the need to control the line, and make it as pretty as I thought the other parts of the page were, I was on my way to some real fun. Letting go of how it looks makes me much more aware of how it feels. 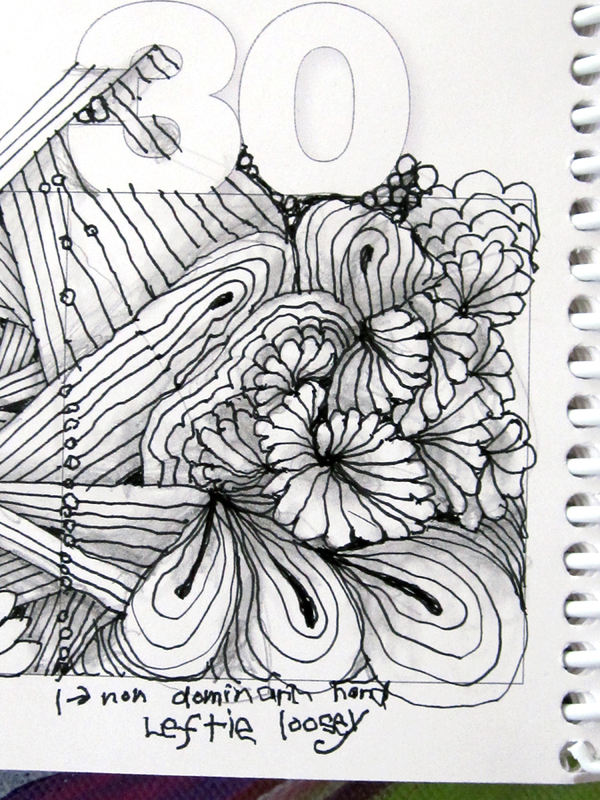 Loosening my hold on the pen helped me release the urge to control it. I went very slowly, not to make a great line, but to feel the line as it emerged from my pen. I love the feeling of the wiggles and wobbles. 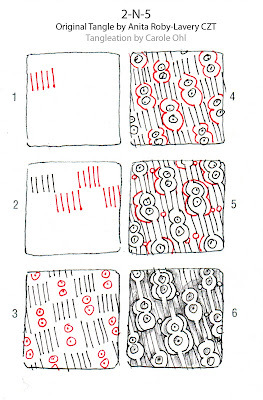 In seeing some of the other challenge participants' work, I was struck by how delicate and gorgeous the wobbles are. There is real feeling in those lines. Makes me happy to look at every one of them. Thanks, again Laura. I have to remember to do this one on my own a little more! And here is the challenge section of the page... if you can't tell, I am in love with Tricia Faraone's Sanibelle tangle. 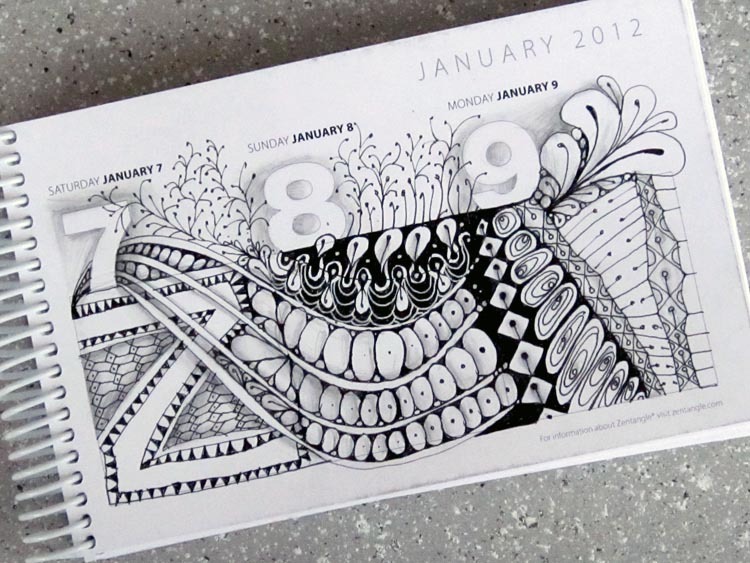 My friend Loretta is having more fun with her calendar, and I wanted to share. I love what she did with her niece's birthday! She told me she used a double sided tape to add the photo, then tangled around it. She found a silver Sharpie paint marker to accent her page. It almost glows in this photo! I love how wild Loretta is getting with her pages. This one is especially joyful. Having a good week, Loretta? Thanks for sharing. Speaking of sharing, a Flickr group has been set up for those of you who want to share your calendar fun online. If I can figure out a way to do a slideshow here on the blog, I will do that too. Thank you all for the great feedback! I am inspired by all of you!! The Diva Challenge for week 55(!) is to make a string using the Moebius Syndrome logo. Laura's son has this rare condition, and she is working hard to raise awareness and support for this Foundation, including dyeing her hair purple (the foundation's signature color)!! Read about the Moebius Syndrome Foundation. It was a little daunting to draw the string, so Laura provided a traceable image. I didn't use it, as I was up for the challenge of trying it without tracing. It's a little wonky but that's just how it goes (on Mondays especially)! I had fun with Margaret Bremner's new tangle, Dansk, and also threw in some orbs (almost exactly a year ago's challenge post) for healing measure. Here's to you, Artoo, and your sweet smilin' eyes! Stuck (once again!) on what tangle to do next, I used my handy dandy Tangle Guide from Tanglepatterns.com. I keep it on my computer desktop so it's at my fingertips! (Check out how to get one here). Thank you Linda Farmer (tanglepatterns.com), Anita Roby-Avery, Mikee Huber, and Molly Hollibaugh! The Diva's 54th Challenge: Purple Haze. Read through Laura's post to find out why she chose purple. 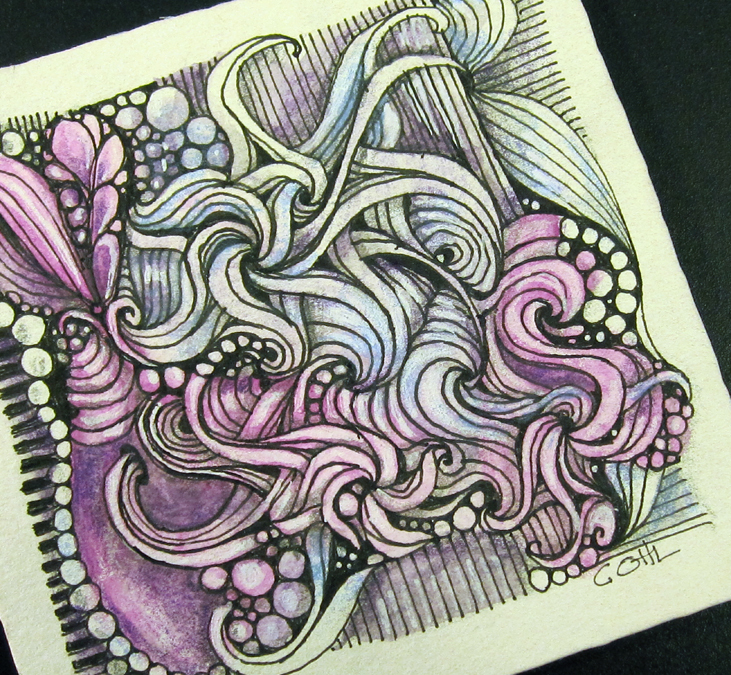 Using color in Zentangle is always a little daunting to me. I rarely think about adding color. Because I love the black and white and shading, I'm quite happy to stick with that. But, the challenge being just that: a challenge, I am grateful to have someone nudge me out of my box, so thank you, Laura! I began with a string of purple blobs, made with random purple watercolor pencils I happened to have handy. The color was a bit more on the magenta than purple side, so in the end, I added a little more purple, and a bit of blue. I was having a hard time with this one, and it seemed like it just wasn't finished, no matter what I did. I could feel myself wanting to overwork the whole thing, so I let it lay for a bit. As always, just when I don't know I need something, it appears. 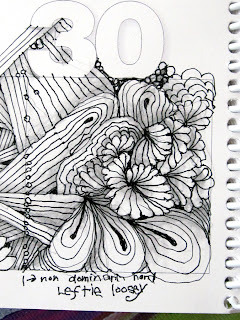 I was blog hopping and was happy to see that Zentangle had a new post. Wa-la! I needed a little dark to balance all that complex swirling I was doing! All the shading in the world wasn't helping, but once I read the blog about the one third/two thirds proportion, I knew that's where the answer was: a little more black! It's still busy, but it feels a little more balanced. Thanks Laura and Maria (and/or Rick) for pulling me forward today. I might just try another! 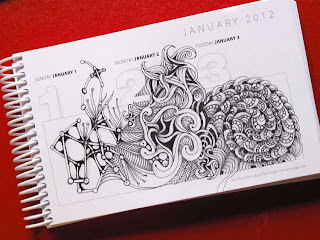 If you're surfing around for more Zentangle® fun and some really great inspiration, you must check out Sandra Strait's (Life Imitates Doodles) review of the 2012 Tangle-a-Day Calendar. Sandra's reviews are always interesting and thorough, and full of useful information about different mediums and their possibilities. 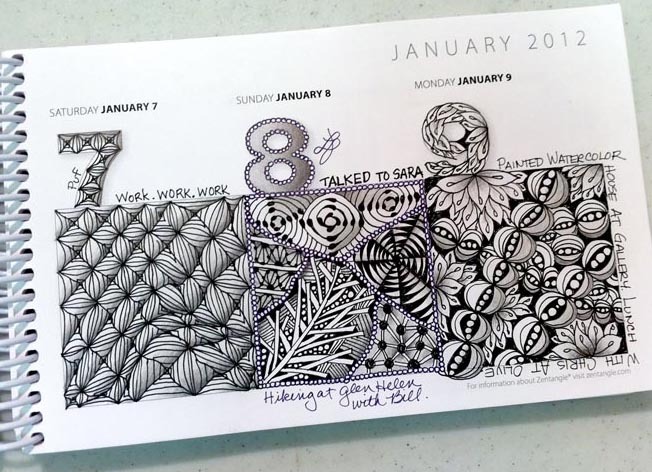 Whether you've been into Zentangle for a while, or just starting out, Sandra's blog always has great info AND awesome eye candy. 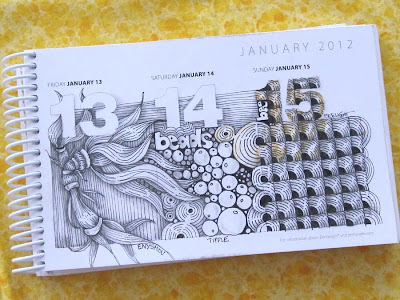 She is also giving away one of the calendars (signed and everything!). If you leave a comment and your email address (by midnight, January 22), you will be entered to win. Winner will be posted January 23. Thanks for the review, Sandra! And thanks to all who have purchased a calendar. We've just printed the second batch! I took my waffle into my office to have a little online fun while eating breakfast. As I hardly had scrolled my Facebook newsfeed, there was a post with a huge image of a bee (art by Amanda Clark). The friend who posted the photo had commented on the importance of bees and their nurturing ways, and how honey was a sacred food. Nice. Big smile from me. I then moved on to my Words with Friends game, and the first person on my list of plays had just played the word, 'honey'. Another big smile from me. Now, as usual, I'm often not sure what to do with the information when it comes at me in this way. I just know I have to pay attention, and treasure each moment and what it has to say to me (or most likely, what I have to say to myself). All I know is that the next thing that popped in my head was to tangle Rick's Beelight in the day's calendar space. So in honor of all the bees and beekeepers and honey eaters: Beelight for January 15. Thank you to the bees, Rick, and my own inner voice. At the time I did the 15th, I was two days behind, so I did the 15th first, as the inspiration was so present for that one, then went backward to the 14 (I bought beads that day, can you tell? ), and then Friday the 13th, the day I got my haircut (Enyshou is a fun tangle!). 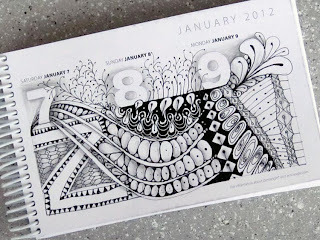 Catching up OR moving ahead in the daily calendar is always an option!! A note about Beelight: The online versions don't always show the "sparkle" that you see on this example. I would encourage you to play with the 'sparkle' anytime you can. It adds a great dimension. Add some shading around the edges, and dang, it looks like it will pop off the page any minute! Undine Love: Diva Week 53! The Diva (Laura Harms, CZT!) 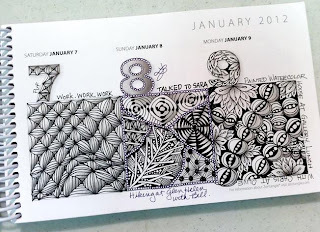 is back to kick off a new year of Zentangle® challenges. Every Monday it's a treat to visit her blog to see what kind of tangly mayhem she's cooked up for us to play with. She took a little well-deserved break over the holiday, and now we are all back in the saddle. 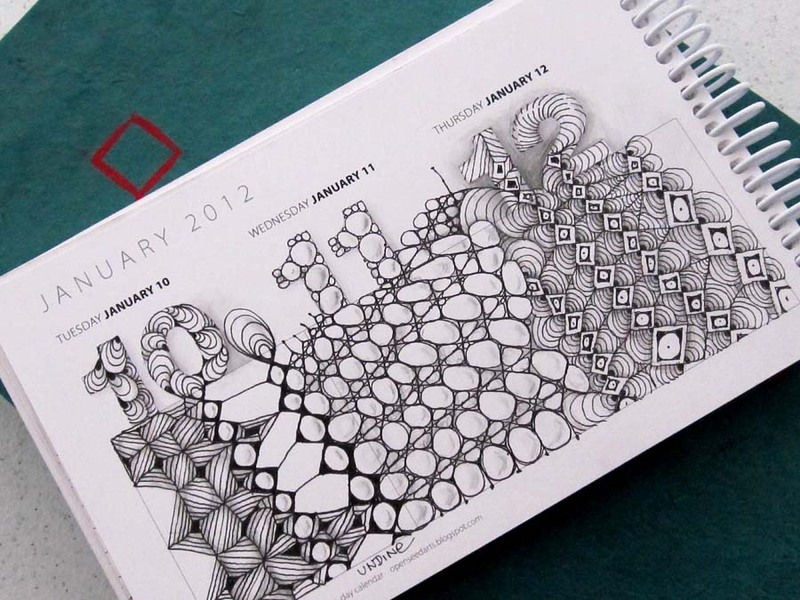 Her new tangle, Undine, is our first challenge for the year. I immersed myself in it for a few days, as there are so many possible tangleations for this! If you go to her blog and scroll down to the list of challenge participants, and visit all those sites, you will see that's true. Thanks, Laura, and welcome back! Thanks for sharing, Loretta. I love what you did with the numbers! 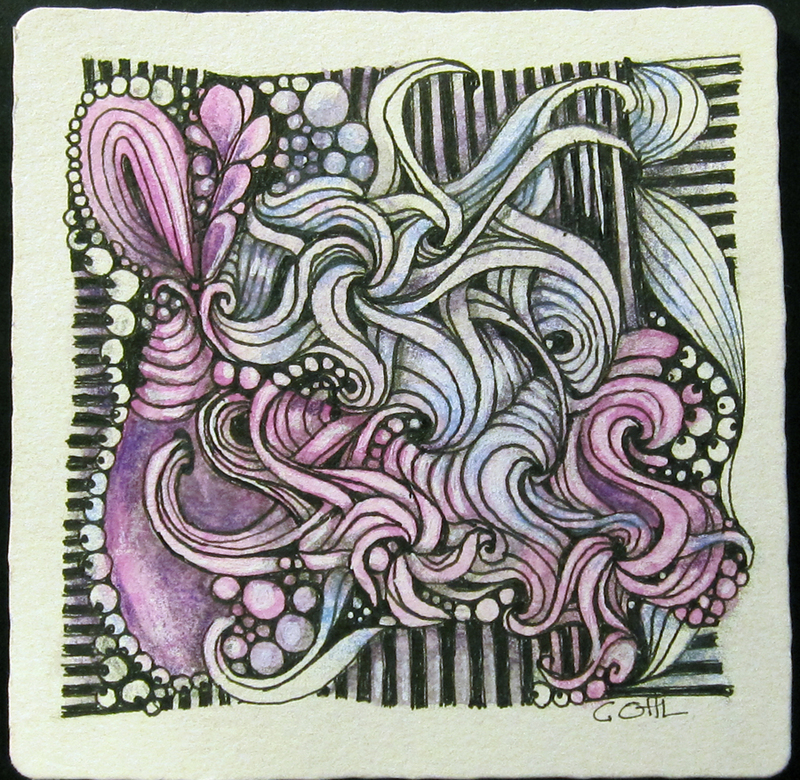 Having some yummy fun with new tangles. I was floating around the internet and landed at Margaret Bremner's place and saw a tangle that really caught my eye. 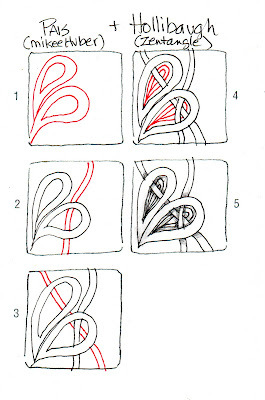 I did some exploring and found out it was one of Sandra Strait's tangles, called Fohbraid. This looks like it might be difficult, but the steps are broken down beautifully. It's one of those that I want to do all kinds of tangleations to, so I'm sure this isn't the last time I will play with it (Jan 4). Jan 5, I was watching a Twilight Zone marathon and those wonky spirals were all I could do for a couple days. 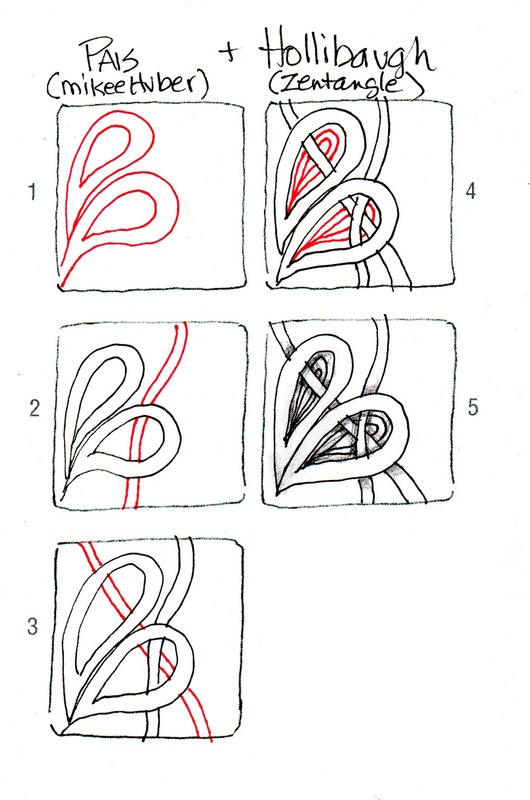 I know there are tangles like this out there, but not sure what it (they) are called. 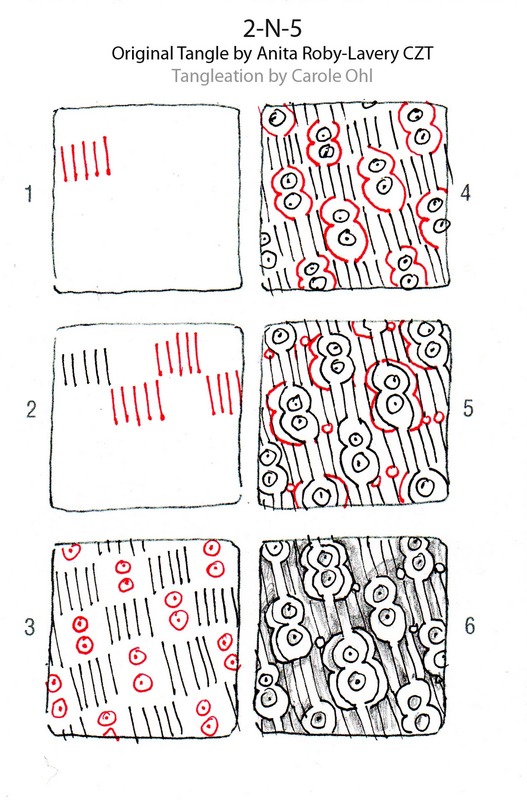 The background for the spirals is one of my all time favorites: Maria Thomas' NZeppel. I love how it always floats so nicely behind other tangles. Then for Jan. 6, there is Inapod, which I hadn't done in such a long time, but it seemed to continue the movement of the Fohbraid, so there she be. Thanks, Margaret, Maria, and Sandra (and The Twilight Zone). 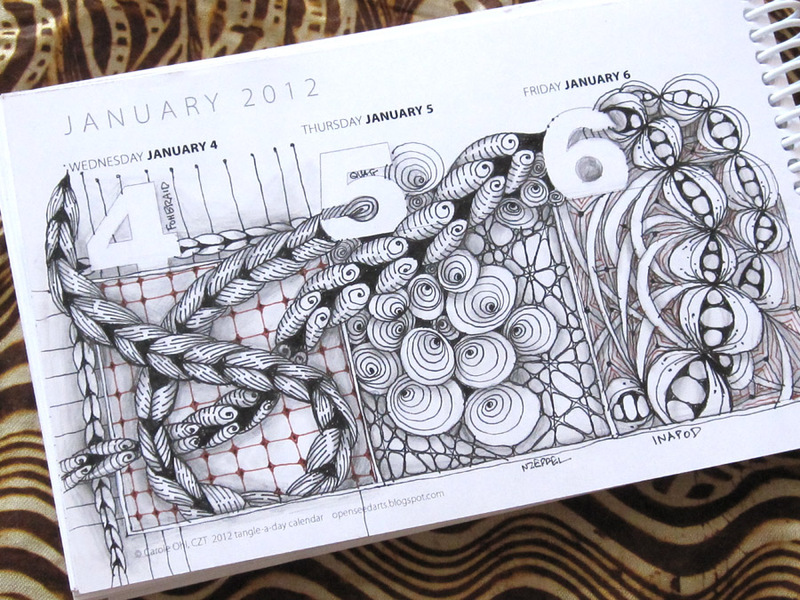 Thanks to everyone who has purchased a Tangle-a-Day Calendar. The printer tells me we need to print another batch, so that we will! My friend and fellow artist, Loretta Puncer, owns Gallery 510 in Dayton Ohio. 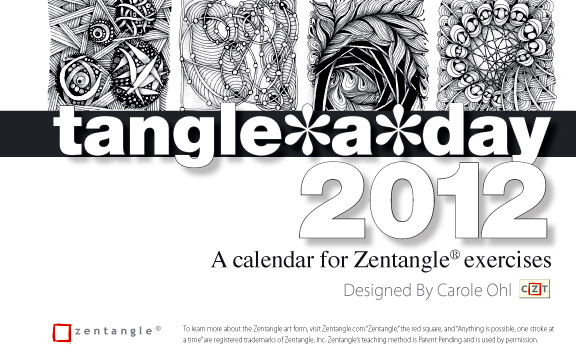 This is the gallery that hosts my Zentangle® classes. It's a beautiful space with a wide selection of beautiful handmade jewelry, art pieces, paintings, ceramics and plenty more. 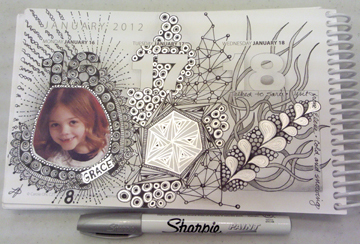 I'm grateful to have such a consistently great space for Zentangle classes. From the beautiful surroundings, to the fresh brewed coffee and tea that Loretta offers the students, it just couldn't be better. Loretta and her husband started the year with a trip to Chicago. 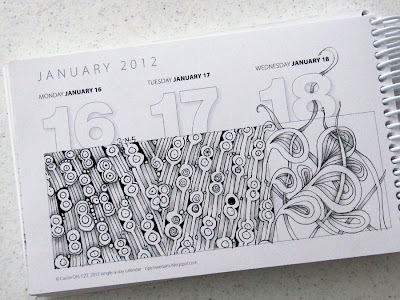 As she left her house, she grabbed one of the Tangle-a-day calendars that I had given her to sell in the gallery. Here (with her permission) is her (awesome) visual diary of her trip. What a beautiful way to record the time! And later, as time passes in the year, she can look back and remember the feeling of being in Chicago. 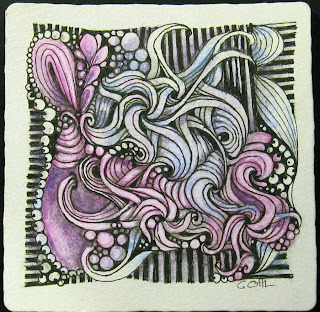 (Read the comment entry by Rick Roberts in this post of the Zentangle blog). 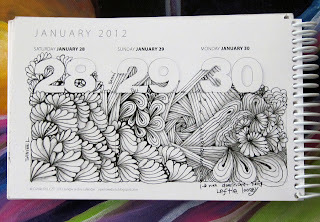 Thanks for sharing it with us, Loretta, and thank you for being the hostess with the mostest for our Zentangle classes! 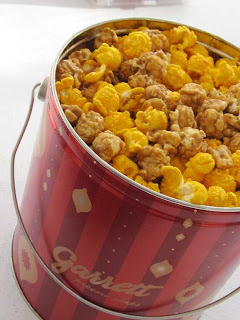 ... tangle time with a side of Chicago mix! 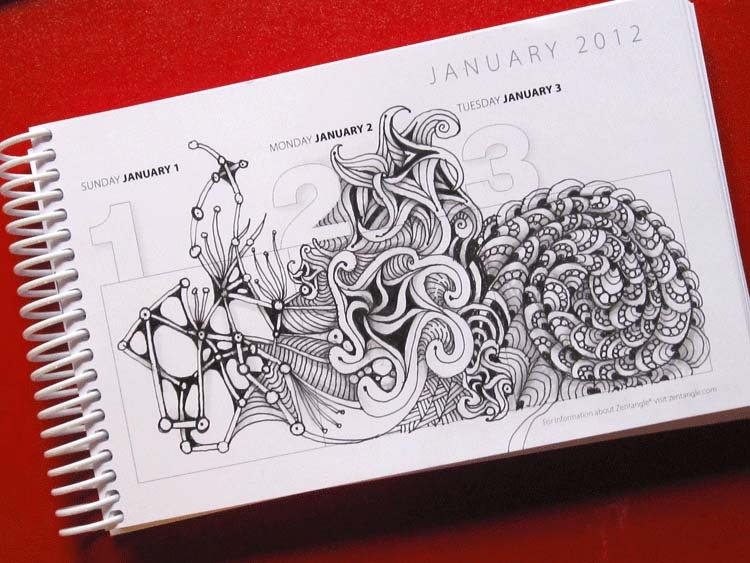 I have no plan of what will happen in any of the daily spaces in my 2012 calendar. 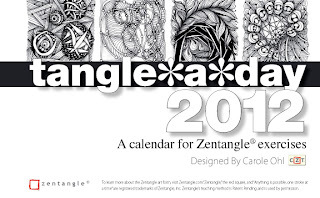 Part of me would like to make a determination of some kind: use it for the Diva Challenge (always a good idea), practice new tangles, start at the beginning of the alphabet and work the tangle names in order? I love all of these ideas, but in the end, what comes each day is going to be a mystery, and I love that too! I am now off to make a pot of tea, do some savoring, and see what appears for today's space!